Thats a fantastic looking fish.. This is an amazing size. I have been planning to come to Hyd next month, am definetely going to call you. Would love to land one of those. @GRC: yeah this murrel is always smiling for camera. Awesome. That's one monster murrel. Lucky fella the one whoe got him. Time for a trip to Hydrabad.... luqman are you reading this? masha allah very nice one,i guess the height of that murrel is 2-3 feet. by the way arish ,where did he caught this,i think he used spinner.? Wonderful murrel caught. I guess it should be in the range of 6 to 7 kg's. The Gentleman holding the murral said it was around 7kg. @spoon angler: yes its is in range of 6 to 7kg as the gentleman himself told uncle that it is around 7kg! @GRC: look at its long tail then how can you underestimate it! @Salim bhai(Flyhigh): even you know him! @Sayed bhai: as mean as the Elusive Monsters of Murud! I saw this pictures because I know the whole story and also know the peoples very well. 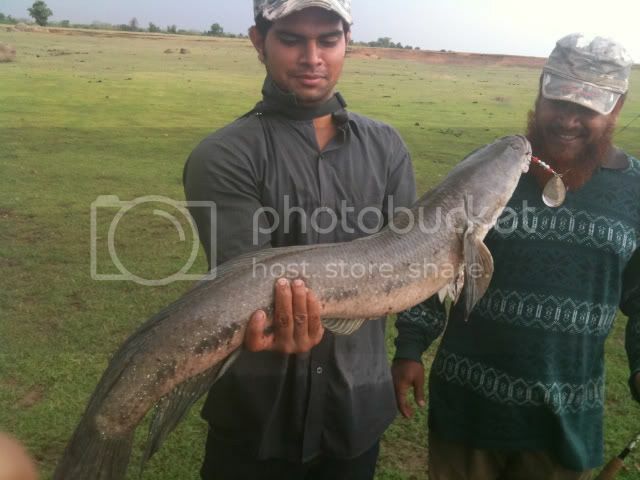 It is Dawood bhai and the fish is caught because I showed them the secrete place to fish. Mr. Chand bhai of the famous maskati gang is also there and this fish is confirmed weight 5kgs. Defanitely not 7kgs. I do not know why people is telling like this for nothing. See one more picture of the same fish below. Also here is where I caught a 4kg murell. See my pictures. Last edited by t7srinivas on Sun Jul 10, 2011 8:56 pm, edited 1 time in total. we all had our share of, "it was this big" Arish... That is what makes us anglers the best story-tellers..
there is an old anecdote which says that fish grow most between saturday when it is caught and monday when the story is told. That is a great murrel Arish.. :) Nice catch.. I happened to speak to Dawood bhai after which i wrote the size. I explained to him about the lake backgdrop since am a regular to from past many years. Even i told him about the spinner he had used....it is colardo blade with vmc make hook - it looked like like eagle claw hook. He told me that it was 7kg hence the number came on the forum. Now if you're confirmed that it was 5kg then it is sad that dawaood bhai ki murrel bhi sunday se monday that 2kgs badi ho gayi . !!! Well it takes a tough angler to admit the truth. Last edited by flyhigh on Wed Jul 13, 2011 10:52 am, edited 1 time in total. @Salim bhai: bade bade logon ke khub khub baatein horein! @ Arish - I normally dont target murrels because there are record size rohus, catlas and mrigals in these waters.. I only fished for these guys when I was in Delhi for a year or so..
Added to this, the murrels here have a steady diet of small fish and crabs, so they are not nearly as interested in frogs as their counterparts across the country.. I may have tried catching them once or twice but no luck.. Like I said, I target carp..
Badal sake to badal do fugan ki lai apni, zamana doosri karvat badal gaya hai miyan. badal saka to badal loonga and i'll change the pic with my photoshop skills if i wish to make it the world biggest murrel i.e 20kg. @ Salim bhai: Didnot you understood what i mean! @GRC: This is fantastic Gavin, please do share your trips stories soon it been very long since your last report, waiting for your reports. Your request has been completed, although what you say will never come true. All those people are real bachas (chinna pillalu) in murell fishing. R U sure I am so old to be considered an uncle? Hi Mr. flyhigh, the lake is same which I mentioned I had shown but Arish bhai told to me to delete it. The blade is also colorado XPS (zattiyal bole to zattiyal) which was ordered by Sohail bhai from Bass Pro, he did not like, and given to XXXXXXXX to copy (I mentioned this name but the Administrator has deleted it) . The hook is VMC not eagle claw B475. VMC hooks is to hevy. But I am learning to catch more so I have to listen to all the experts here like you and Dr. Amir sir and Arish how to catch more. Thanx.